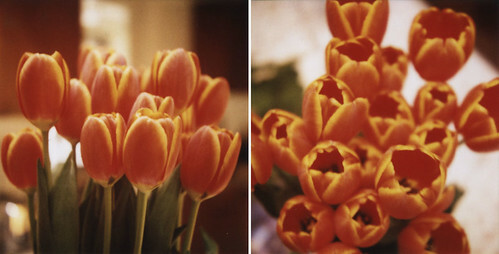 My sweet husband brought me beautiful orange tulips for Valentine's Day. (I know, just what you wanted *more* tulip shots!) I love them. And him! We usually don't do much for Valentine's Day, but he snuck in a few more presents this year. A lovely tin of chocolate covered almonds and this nifty combo salt and pepper grinder that I've coveted ever since we saw it in the fancy kitchen store on the Plaza. We went to Albuquerque yesterday to run some errands even though we were both exhausted. Will had to drop off a piece of recording gear at a repair shop and I wanted to buy a camera that I found on craigslist. (More on that later.) We had a quick lunch at the Flying Star in Nob Hill between errands and then stopped by to see Christine and Trevor. They just moved into a gorgeous loft apartment in downtown Albuquerque. It's next to a castle. I kid you not. I took a bunch of Polas that I'll post soon. It's a mind-blowing place. Oh, I am totally forgetting half the reason I am writing this...duh. 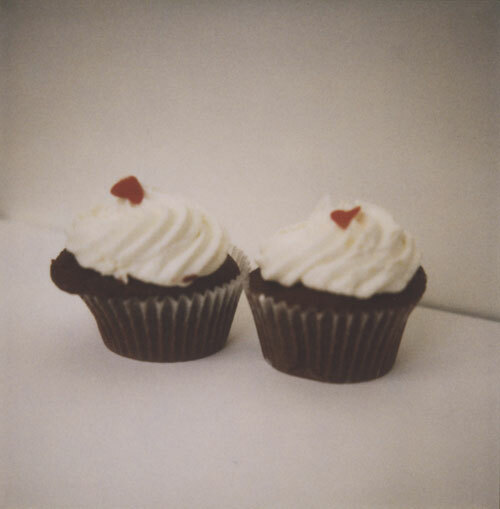 Since yesterday was Valentine's Day, we thought we should get something sweet for dessert. I looked up cupcake shops in Albuquerque and found Cupcakeology. I was sold on it the minute I saw that they have Red Velvet Cupcakes. So good. And such a cute little shop. I got totally carried away picking out more cupcakes. Will had to stop me at eight. 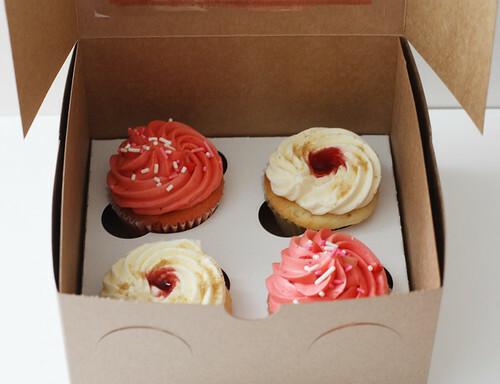 In addition to the red velvets, we got strawberry and vanilla cheesecake cupcakes. Today I've done three loads of laundry, vacuumed and gotten distracted at every turn. I also went out to find a battery for my new camera and got lucky at Radio Shack. And now I think I've been on the computer way too long.